Size: 8 oz - Foam Cups, 9 sizes 4 oz., 8 oz., 10 oz., 12 oz., 16 oz., 20 oz., 24 oz. and 32 oz. Lowest cost per unit. Excellent insulating value. Vibrant imprints. High impact material. Only available in full case packs. 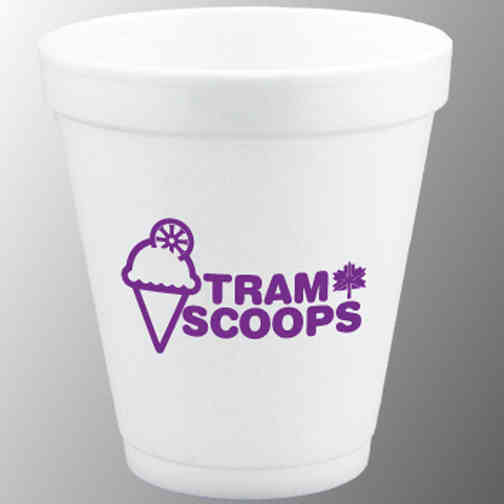 Great for take out service, soft drinks, frozen drinks. Sampling cups. Price Includes:One color imprint on 1 or 2 sides, same imprint both sides. Imprint Size:5" x 5", 4 1/2" x 4 1/2", 3" x 3", 2 3/4" x 2 3/4", 2 1/2" x 2 1/2", 2" x 2", 1 1/2" x 2 1/4"
Ship Weight:Weights vary by cup size, please call for specific weights. Lids available. 1000 per case.